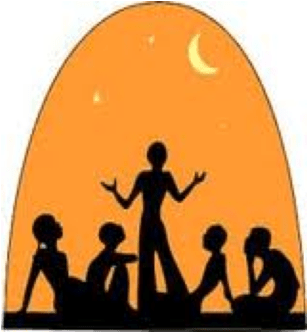 We begin the Learn Kiswahili journey as a standard course, this includes exchanging the appropriate greetings and talking about daily activities and progress to an intermediate level with exercises and practical application. Welcome, take this journey with me as we delve into the new KISWAHILI millenium .....#THE LANGUAGEREVOLUTION.....COMING SOON! This is types of greetings which you can use at any time of the day, be it morning, afternoon, evening or night. Joni: Habari za leo? How are you today? An alternative is Habari Gani? How are things? Maria: Nzuri sana , hujambo? Very Good , how are you? Joni : Asante, Kwa heri Thanks , Goodbye! Baraka: Habari gani ndugu? How are you friend. Maria: Nzuri, hujambo? Am good, how are you? Habari za saa hizi? How are you this time? Nzuri , hujambo? Good , how are you? Mambo vipi? How are you? This greeting is used from young person to adult as respect. Marahaba I accept your respect. Joni: Habari za asubuhi? How are you this morning? Maria: Nzuri, hujambo? Am good , how are you? Joni: sijambo sana         Am very fine. Joni: Habari za mchana? How are  you this afternoon? Maria: Nzuri sana. Hujambo? I am very fine. How are  you? Joni: Sijambo dada            Am fine sister. Maria: habari za jioni? How are  you this evening? Joni: nzuri dada, hujambo? Am fine sister, hows you? Maria:Habari za usiku ndugu? How are you this night friend? Joni: nzuri, hujambo? Am good , How are you? Maria : sijambo rafiki          I am good friend. Uko poa? Are you fine? we have six personal pronouns in Swahili. Amani:  Jina langu ni Amani                My name is Amani. Na wewe je? And what about you? Joseph: Jina langu ni Joseph               My name is Joseph. Amani: Umetoka nchi gani? Which country are you from? Joseph:   Nimetoka marekani                I am from USA. Amani: Nimefurahi kukutana na wewe         I am happy to meet you. Joseph:  Naitwa Joseph           I am called Joseph. Amani: Naitwa Amani             I am called Amani. Joseph: Umetoka nchi gani? Which country are you from? Amani: Nimetoka Uingereza        I am from England. Na wewe je? What about you? Joseph:Nimetoka Tanzania         I  am from Tanzania. Jina lako nani? Whats your name? Jina langu ni Amani       My name is Amani. Na wewe je? What about you? 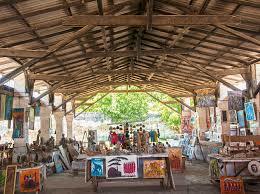 #CreatePreneurAfrica, Bagamoyo’s Pili Mtonga -The Art of Passion@Fashion! Bagamoyo (where I lay down my heart), in East Africa,Tanzania is a remote historic town with relics of the past infused with realms of the future. There are many passers-by, essentially so, but those who have not come across #CreatePreneurAfrica Pili Mtonga's eyecatching 'fashion with a passion' base across the Bagamoyo art market, have missed out on the true creative essence of the art throbbing landmark of note! Pili Mtonga’s early beginnings of creativity initially began to launch when she was selected by SVETAN – a Swedish Tanzania Association Scholarship. She then went on to the Gotland College of Arts study abroad program and the Royal art academy in Sweden. It was all about modern art, carvings, sculpture, and design. Back home in Tanzania, Arusha she joined an African American community center for children’s education programme at St Margaret’s primary school and trained in handicrafts. Eventually, she became engaged in fashion design, handmade designs until the introduction of manual sewing machines opened up an exciting brand of uplifting possibilities of mass production and a team. Visitors order an item they desire, and it is designed and created within a few hours! 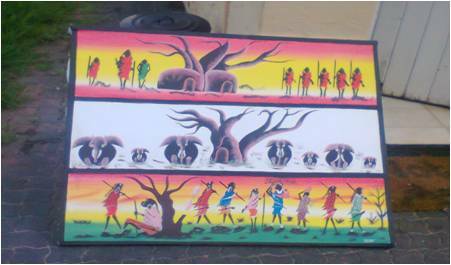 They leave with an authentic Bagamoyo masterpiece of crafted style! Pili has triumphed in her zest for the creation and has become a soul healing ‘must see’ phenomena in Bagamoyo! What drives me….my family…and creating happiness…or should I sat satisfaction, when I see people in awe of seeing their visions become a reality. I don’t know where to begin…if it’s about stating a year all age…I don’t remember when I was not passionate about creation…in so many forms. What appeals to me, in my current line creating designs is seeing smiles. I just love giving people what they ask for…making dreams a reality. When you love what you do, you make sure your passion sustains you. Or you will spend all of life’s, precious moments in disarray and frustration…that causes all the chaos in today’s world. When people are forced to do what they have no desire for..because society and the economy preaches it as good choices.I chose to do what I love. And I make a living from it. I used to repair and ‘reinvent’ my worn out school uniforms…economically. it made better sense than getting a new supply. Others noticed and their parents gave me little rewards first for their kids and then gradually for them too! What kept me going is motivation. I knew a lot depended on me. I had to make it happen. Knowing the round world is abundant and my product has reached every corner of the world through tourist passers-by who always take treasures back home. What do you have to say to all of the people who doubted you? Keep doubting…I will keep doing. Little precious time left to pay attention to doubters. This is very important to me. I want to empower all around me. I usually give workshops and training to women and youth. Volunteers from abroad are keen to learn fashion style beyond commercial boundaries as well. There are so many possibilities and I know I sharing these skills will be a tool to uplift so many. I see this as my purpose in life and my main aim is to get an efficient workshop space in order. I know once this is there, my heart….along with all who pass by will be filled with joy! Posted on August 12, 2018 August 18, 2018 Author exploreafricaCategories #CreatePreneurAfrica, #OnlyInTanzania, Africa, Africa art, art in Tanzania, Bagamoyo, Tanzania, Tanzania, Travel, Women from AfricaTags #CreatePreneurAfrica, Africa Modern Art, east africa art, TanzaniaLeave a comment on #CreatePreneurAfrica, Bagamoyo’s Pili Mtonga -The Art of Passion@Fashion! 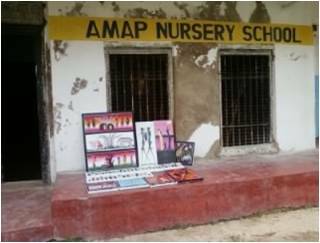 AMA, Africa Modern Arts , in the heart of Bagamoyo , Tanzania is a grassroots organization initiated by Saidi Mbungu, a renowned sculptor that has had his work exhibited internationally. AMA is for sharing skills of craft to all interested in learning. There are so many fulfilling experiences, that volunteers are always drawn to the establishment of AMA. He aims to keep them off from dubious activity and empower them for a bright future ahead. My true passion is art. I believe art is empowering. It is a golden key, an outlet of expression. A tool of upliftment. 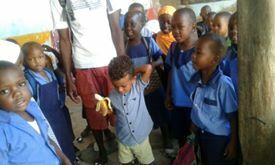 There is no free schooling in Tanzania, there is a need for an outlet for education. The youth in Bagamoyo are orphaned or poor. I started AMAP school in my backyard. The thought of being a creator is amazing. You are on a throne of power after a piece of work is complete. I cannot even explain that element of total upliftment. There is so much bereavement, so much poverty surrounding our everyday life. Tourists are free to explore and enjoy our natural wonders, but we are so caught up in our economic disempowerment. But we have the tools and the talent of natural artistic skill. This is how we can rise as a nation! I remember the day. I was young. I cannot remember how old I was. I just remember the time was not good. There was little hope, scarcity at my home that triggered so many tensions. I sat outside creating an art piece of recycled materials. A passerby noticed. I was still in the process of polishing. They waited in wonder and handed a batch of notes and takeaway snacks and a juice too! I was delighted! Adversities are always there. They come and go. I recluse and engage in a new piece of work and I am lifted and inspired. The kids around me. Our coming generation. They uplift my soul to reach to the stars. I want to tell all that aspire to keep holding on. I believe in sharing hope. We can rise up together. It was a soul calling to the remote town in Tanzania- Bagamoyo ( “I lay down my heart”) when Thomas Mura was born. His life purpose flowed into the rhythmic airwaves as he began tuning in drum beats into the neighborhood in Bagamoyo. An avid soccer player, he spent his days teaming up on soccer fields honing him into a team player for his community. Sharing his soccer skills and easing off at the Bagamoyo beach, Thomas soon became a yoga practitioner, sharing his gained wisdom into healing pathways for the future of Bagamoyo. 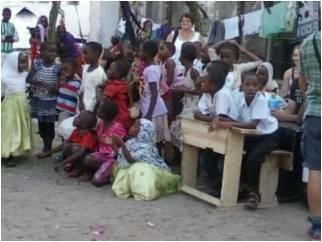 Many volunteers in Bagamoyo flocked to hear sounds emanate blending in with the soul beat of Bagamoyo. 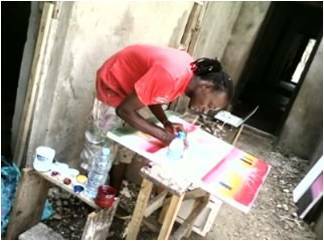 The artistic soul of Bagamoyo is captured in TASUBA, an arts college with an annual Bagamoyo festival drawing world crowds and special guests. The Bagamoyo festival featured a special guest all the way from South Africa, the legendary soul sister, Tu Nokwe, sharing her musical talent, life skills and knowledge into the heart of Bagamoyo. 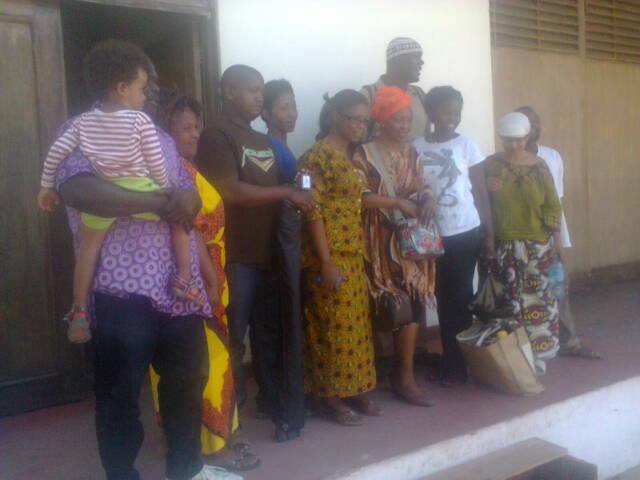 The shine of her light sparked off in Bagamoyo eventually spread out to Morogoro at the Juu Afrikan Festival. My passion. Where do I begin? Well, the beginning of drumming away rhythmic healing beats. I spend time on soccer fields and at Bagamoyo beach sharing my purpose in this life creating yoga retreats and spreading soul healing! My early days in the pathways of growing up in Bagamoyo shaped all of my existence. Being heard! Many of our lives are filled with sea waves of tides streaming in and out. It sometimes topples our smooth flow. Drumming for me, was for me,, but the rhythm spread out. I am now part of an acrobat and drumming band, the Mafisi group in Bagamoyo. We plan to stream our vibe into every gravel in our land Tanzania. We plan to reach out to the continent of Africa, our motherland. Survival. Beach days and drumming away made up the essence of me. Time to ease out at yoga sessions and the soccer field filled my soul. That is when I decided to share all I have gained,I need income as well. Watching the waves on the beach front. Knowing that there are high and low tides for all of us, I kept on going in soul meditation in the breeze of the sea. I will wave them away and wish them all the best. Tide in,Tide out! Keep following your passions. Stay at it, even the toughest of times do pass by and you will be uplifted in spirit and soul.